If a search has been carried out, it is possible to download annotations (where they exist - and they will not exist in the case of entries for strains from legacy MLST in the results). Select Annotation from the Experimental Data drop down menu (on the top right of the page). Annotations can then be downloaded in gzipped GBK or GFF format byclicking on the icons with downward arrows in blue circles in the relevant column (for GBK or GFF) for the desired strain. 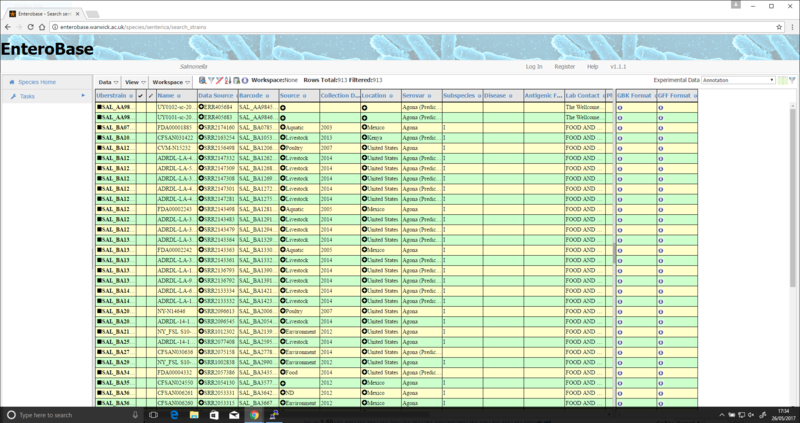 Alternatively, multiple annotations may be downloaded by clicking in the box next to the desired strain in the column headed with a tick icon (just to the right of the “Uberstrain” column which is on the far left of the table).